Avery Hodge's aggressive defensive play started attracting colleges in her 6th grade year before she was offered and committed to Oklahoma last September. 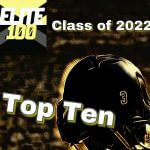 Here it is… the end of our two week’s worth of publishing lists honoring the top 100 players in the Class of 2022 as today we present the Top 10! We at Extra Inning Softball have spent the last month talking to more than 100 club and college coaches, as well as watching players at events nationwide over the last year and have used that information to unveil 10 prospects per day over the last two weeks as we moved down the list from 100 to No. 1. Players are selected based on on-field talent, successful performances—especially in big events like Nationals, projected growth and development and intangibles such as leadership, work ethic, and the ability to make teammates better.